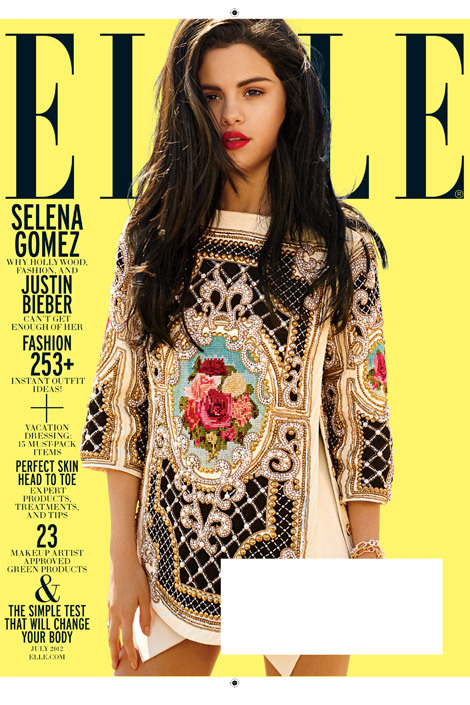 The "Love You Like a Love Song" starlet appears on Elle's July cover! How major does she look in both cover shots? Fabulous! The colors are so summer-saturated! Which cover do you like best? Here Selena wears an embellished mesh corset dress from Dolce & Gabbana. Loving the golds/metallics they've paired with this look. Her red lips and simple makeup are just right for the shot, considering they're going for a summer look. I personally love this cover the best! This one is the one subscribers will receive in the mail. I'm obsessing over the embroidered Balmain top she's wearing. This shot is so different and not your typical skin-baring cover shot either. Her red lips are all she needs. So excited for my copy to arrive! selena is so stunning! love your blog! would love for you to enter my jack rogers giveaway! !